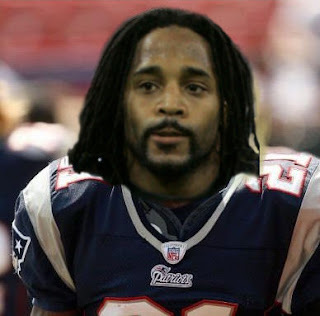 This is how I want to remember Bob Sanders...as a Super Bowl champion and Defensive Player of the Year. I want to remember how he decleated Laurence Maroney in the AFC Championship Game...I want to remember how he launched himself like the Human Bullet at receivers, running backs, quarterbacks, and anyone else foolish enough to wander into his target zone. 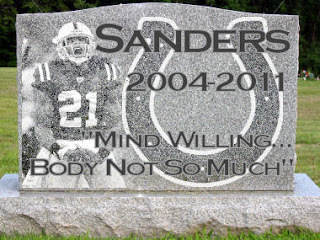 But today, we mourn the passing of Bob Sanders the Colt. For every hitman must meet his maker someday, and for #21, that day is today. It is neither a surprise nor a shock that Bob Sanders is no longer with the Colts. He missed more games (64) than he played in (48) since being drafted in the second round in 2004. Yet, we fans know he was a game changer, a rare player who, when healthy, changed the complexity of the game for the Colts. We lament how his body failed him and did little to justify the generous contract awarded to him. It is my belief that Bob Sanders will once again roam the football field, stalking opposing players, ringing the bells of receivers who dare cross the middle, and knocking running backs on their posteriors. We have only but one last plea to offer our beloved hitman: choose your next team wisely.